Very cool! A friend of mine introduced me to a great program called Kik. It allows you to chat across all smartphone platforms, quickly and easily, without having to jump through any hoops. It totally reminds me of the glory days of chat, where Msn or Yahoo or AOL were our social networks… I have never installed a chat program on my phone, read my full review to see why I changed my mind! I have 2 main reasons why I dislike chat programs on my phone. The first is that they tend to be much slower than their desktop counterparts, and the second is that most are not inter operable. It might work on my droid and your iphone, but not blackberry, or the other way around. There just is no cohesiveness. 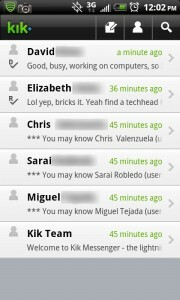 Well, let me introduce Kik! it allows you to stay true to your platform of choice, be you a Crackberry addict, a Droid aficionado, or an iPhone disciple. Better yet, if you leave your phone platform, you dont need to create a new account! Just log in to kik from your new phone, and you are set! I love how simple the program is as well, there are not a lot of bells and whistles, it focuses on making sure that the chat is solid, which is wonderful! The screenshot above shows the default screen when you enter the program. The first time you enter, you are given suggestions as to who you should add. I am a little perplexed as to how they know that I know these people. My guess is that it scans my contact list, and gives me a list of people who are on there, but a few of the people there I didnt have on my phone list. Very strange… From this screen you can see you most recent conversations, and people you can chat with. 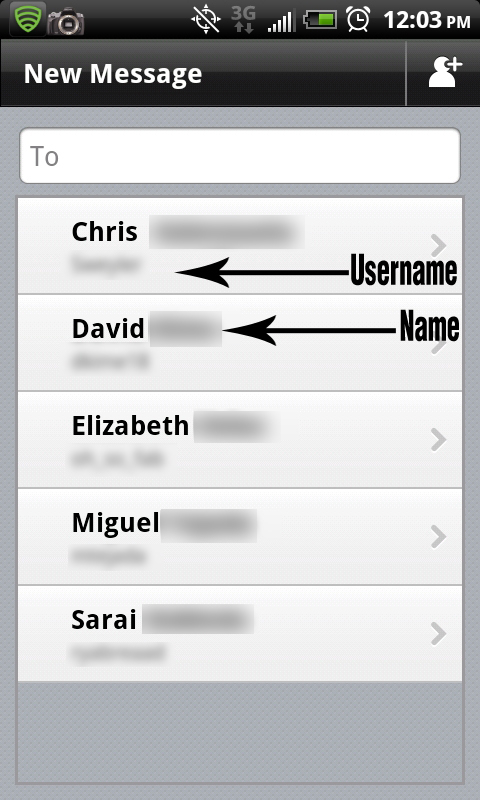 On this screen, you can see the username and full name of each of your contacts. 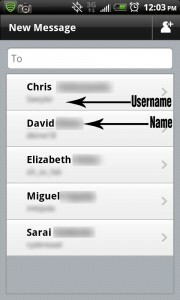 This allows you quick access to whomever you want to chat with. simply click on the new message icon on the home screen to bring this up. Once again, very simple! 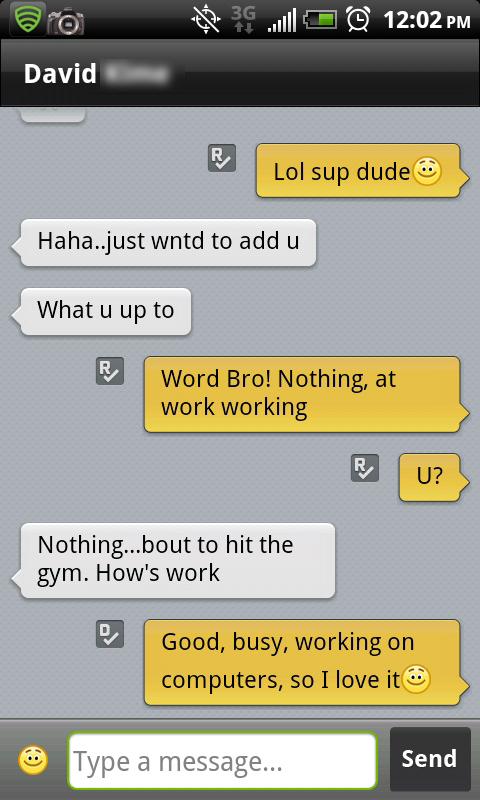 Here is a sample conversation on Kik, just me and my friend catching up. The messages are delivered very quickly, and there was no noticeable lag. I love how quick and simple it is to use. 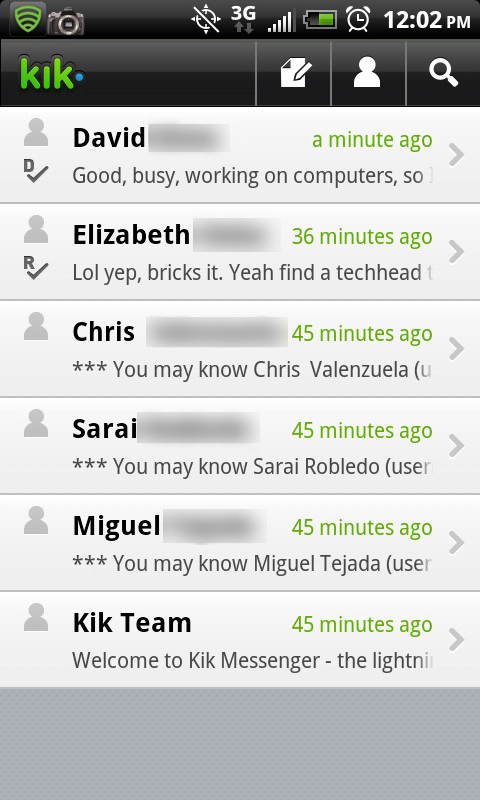 This is my gripe with Fring, they are similar to Kik, but they make things very complicated, they completely import your phone list, making it hard to find friends, and it had some lag issues as well. 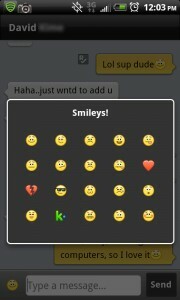 Also, Fring doesnt work for blackberry, so that completely kills it for me as many of my friends love blackberry! 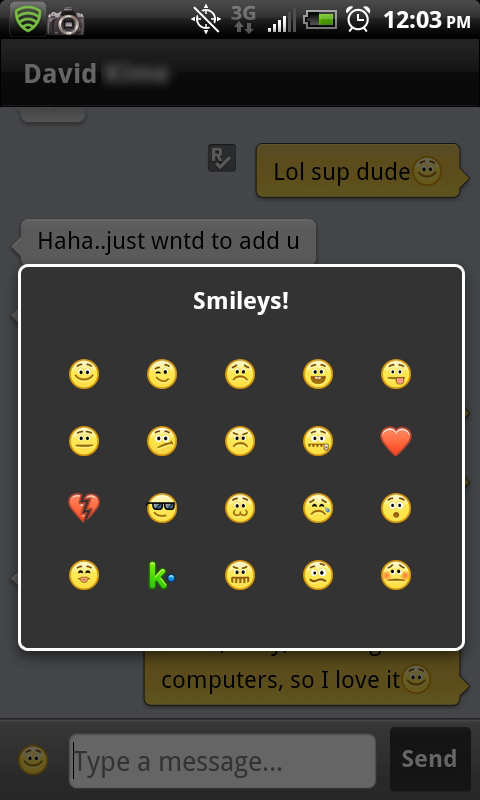 Ok, so my only gripe with Kik: No desktop client! At work, I like to plug in my phone, and leave it alone. I dislike having to worry about my battery, and I dont like to type on it while at work either. I have a nice keyboard. Let me use that. Now, I don’t know if one is in the works, but in my opinion, it should be. ← Limewire Died, Now What? iGotChat is better. Check it out.